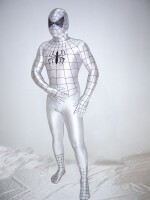 white Spiderman Costume on sale.stretchy,comfortable and cheap price. The Costume of Ann Weying who is The She-Venom In The Amazing Spider-Man.Stretchy,comfortable and cheap costume A full body covering zentai suit with lycra material adopted,the zentai suit is white and black colored. 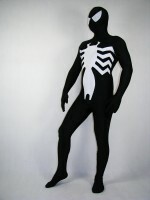 it's the open mouth style spiderman.the siper on the front is..
this Spiderman Costume with lycra spandex material adopted,the suit is classic Black and white colored. the spider and eyes are white color. the suit will be the same as you see. only the front has the spider.hands and feet are black.zipper is on the back. Color: black & white.. This Black Spider-Man Costume is the costume when spider-man been bond with Venom Symbiote. 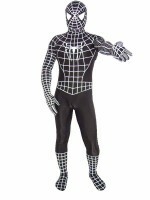 A full body covering spiderman costume with spandex lycra material adopted, the spiderman costume is black colored with white stipe.this is the new design spiderman, so it also has spider on ba..
Black Spiderman Costume very Classic Black Spiderman Costume . it is made with the lycra spandex material,the eyes are made with corespun ,so you can see out well. only the front has the white spider. it is the full body design. 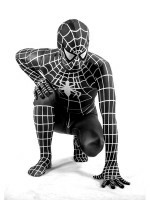 we provide standard size you can just choose it,or you c..
Lycra spandex spiderman,black color full body spiderman with white big spider on the front,white gloves and silver eyes. the back has no spider,but if you want to add spider on the back you can contact our costumer service. Color: Black & white Fabric: Lycra/spandex Surface: Matt.. The Costume of Eddie Brock who is The first Venom In The Amazing Spider-Man. Lycra spandex spiderman,the full body spandex spiderman costume with a big spider on the front. only the eyes and the spider are white other part all are black. 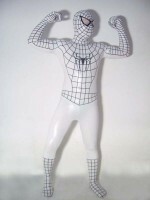 the white eyes can see out a little,but if you want..
this Spiderman Costume with lycra spandex material adopted,the suit is white colored.spider stripe are black. full body degisn with black corespun eyes,you also can get it with hood attached.zipper on the back. 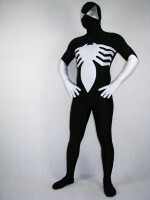 Color: black & white Pattern: Yes Fabric: Lycra/spandex Surface: Ma..
White lycra spandex unisex spiderman zentai costume suit outfit zentai with black stripe,full body zentai spiderman. it is new style spiderman so it's stripe is different with the first spiderman.and there also has a spider on the back. zipper is from left to right. You could fill in your..